It’s been reported to Fergana that Rustam Usmanov, formerly a well-known businessman, sentenced to 14 years in prison in Uzbekistan upon a number of tax charges in 1998, has recently been sentenced to another five years in prison under the article 221 of the Uzbekistan’s Criminal Code (“Noncompliance with requirements of the prison administration’). According to our own data, the 14-years-long imprisonment of the former banker Usmanov ended on the 14 of February, 2012. However, he has not been released as expected but sentenced to another five years in prison. There is no official confirmation of this information yet. His defense attorney has not received a copy of the new sentence that should explain the reason for such a severe punishment (longest possible sentence under the article 221). Rustam Usmanov’s name is well-known to anyone interested in the modern history of Uzbekistan. Doctor of science and author of numerous economic publications, member of the Union of journalists and independent writers of Uzbekistan, Rustam Usmanov had founded the first ever private bank in the Central Asia in the early years of Uzbekistan’s independence. Some observers choose to compare his life story with the destiny of the Russian businessman Mikhail Khodorkovskiy, persecuted severely for having political ambitions. Back in 1998, after demonstrating some political activity, Ruystam Usmanov had been found guilty of a number of economic crimes and sentenced to 14 years. Rustam Usmanov had spent his first 10 years in four different jails, and never had a chance to enjoy any of the numerous amnesties, traditionally granted by the authorities on occasion of various national holidays. 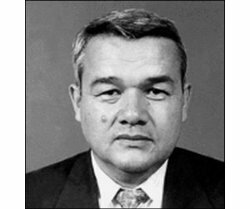 His name can be found in the list of political prisoners and of those convicted upon fabricated charges, published by the Initiative group of independent human right defenders of Uzbekistan and distributed among international human right organizations and diplomatic missions of democratic states along with an urge to put a pressure upon the president Islam Karimov and his regime towards release of the businessman. Notably, Rustam Usmanov is actually a citizen of Kyrgyzstan, but this country’s authorities appear absolutely indifferent as to the destiny of this prisoner.